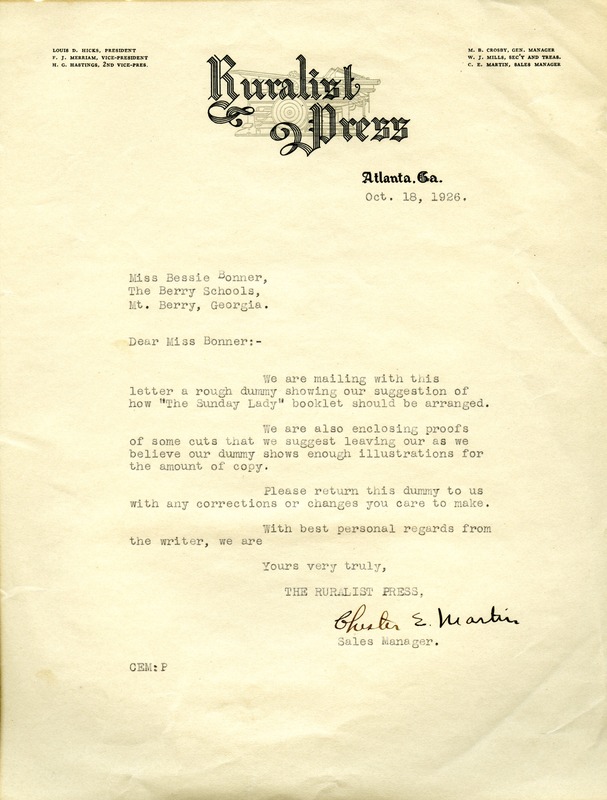 Letter to Miss Bonner about the arrangement of "The Sunday Lady" booklet. The letter accompanied a dummy example of the booklet for Miss Bonner to review and return with any changes. Chester E. Martin, “Letter to Bessie Bonner from Chester E. Martin.” Martha Berry Digital Archive. Eds. Schlitz, Stephanie A., Sherre Harrington, Sarah Milway, et al. Mount Berry: Berry College, 2012. accessed April 20, 2019, https://mbda.berry.edu/items/show/2863.